Thanks, gonna be installing these. Makes me wonder why it's albeit temporarily during installation disables a network connection. EDIT. : ok, again ..windows update decides it wants to install together with AMD driver. It's the same at the source, but perhaps nothing was fixed; in other words, business as usual. I'll wait until the fixed issues differ from known issues. They have updated the change-log. Did the new drivers fixed OCing/Temp Monitoring? 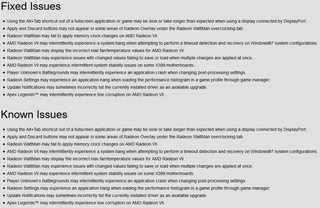 *Radeon WattMan may fail to apply memory clock changes on AMD Radeon VII. *Radeon WattMan may display the incorrect max fan/temperature values for AMD Radeon VII." - ... but not as much as before.